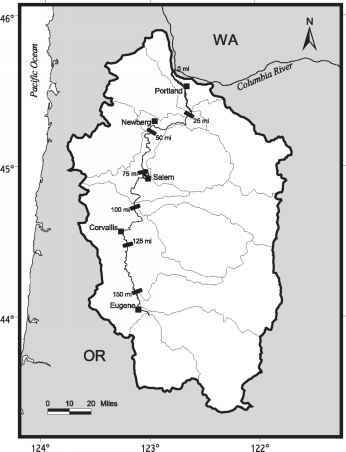 With a watershed of 11,200 square miles, the Willamette River basin in northwestern Oregon is bounded by the Coast (west) and Cascade (east) mountain ranges, which have a north-south length of 150 miles and an east-west width of 75 miles (Figure 132). 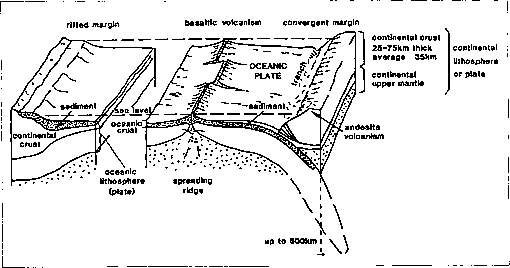 Elevations range from less than 10 feet at the mouth near the Columbia River to 450 feet in the valley near Eugene to greater than 10,000 feet in the headwaters of the Cascade mountain range. Physical transport in the river can be described in terms of three distinctive physiographic reaches and characterized by the key physical parameters that strongly influence water quality—length, summer low-flow velocity, and travel time (Table 13-1). The longer travel time in the tidal portion of the Willamette River (10 days) can lead to decreased water quality.